Today is the day! 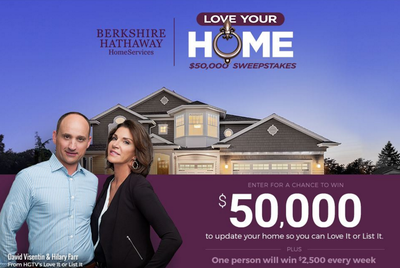 The annual Berkshire Hathaway HomeServices $50k Sweepstakes kicks off today with the HGTV stars of Love It or List It, David Visentin & Hillary Farr. It’s time to get the word out! This is your chance to WIN BIG! Best Advice - Once you register and submit your entry into the Sweepstakes, share with all your Facebook Friends and Family! Ask them to share and in doing so, every time you and your Facebook Friends & Family share the link - you will receive another Entry into the drawing!